Giraffes and hippos and elephants, oh my: this once-in-a-lifetime, 12-day safari experience through Botswana, Zimbabwe and South Africa is perfect for animal lovers. Home to some of the world's most incredible creatures and most striking landscapes, every step of this Southern Africa trip has the power to inspire and transform. Witness the awe-inspiring Victoria Falls, a true world wonder; enjoy a sunset cruise along the mighty Zambezi River; and unwind at the luxury Cresta Mowana Safari Resort & Spa in Botswana in the Chobe region, home to incredible wildlife. Search for lions, leopards, cheetahs, buffalo and many more animals with two included game activities per day. Then continue on to vibrant Cape Town where you’ll get to unwind with free time and also enjoy a guided tour of the scenic Cape Peninsula. Package includes return international flights, six nights quality hotel accommodation, three nights in luxury Safari Lodge accommodation, 15 meals, up to five game safaris and more. Want to delve deeper? Upgrade to the 16-day package with Garden Route extension and experience one of South Africa’s most unforgettable coastal drives. Visit Cango Caves, Bramon Wine Estate and more! Today depart from either Sydney, Melbourne, Brisbane, Adelaide or *Perth for Victoria Falls, Zimbabwe. Fly with award-winning South African Airways. Please note: Due to flight scheduling, some Adelaide customers may experience a long connection time in Perth. Affected customers are able to leave the airport if they wish. Day 2 Welcome to Victoria Falls, Zimbabwe! Upon arrival at Victoria Falls Airport you will be met and transferred to the hotel. Cresta Sprayview Hotel is situated just 1.4 km from the Victoria Falls Rainforest entrance. It’s the perfect getaway for adventure seekers exploring the resort town of Victoria Falls and its surrounds. In months when the Falls are in full flood, the spray from this majestic wonder of nature rises like a column of smoke, locally referred to as “Mosi-oa-Tunya” the “Smoke that Thunders” and can be seen from the hotel, hence the name Sprayview. The hotel is also located within walking distance of the town of Victoria Falls. This morning you will be collected from the hotel and travel to the falls. Visiting Victoria Falls is a truly awe-inspiring experience – the sight, the sound, the smell; the humbling feeling that you’ve encountered a masterpiece of mother nature. No photograph can do the falls justice, and nothing prepares you for your first sight. The tour will be conducted in the morning. En-route, you may be taken past the ‘Big Tree’ where you can stop and take photos. You will be accompanied by a qualified guide, who will offer a brief history of the falls themselves, as well as detailing the flora, fauna, bird and wildlife and other points of interest. Guides are also happy to assist you with photographs whilst visiting this most spectacular of waterfalls. Raincoats are provided when needed. The afternoon will be spent at leisure. Today enjoy the morning and early afternoon at leisure. In the late afternoon, you will be picked up and transferred to the jetty for a Zambezi Sundowner Cruise. The cruise is a superb way to relax and admire the spectacular beauty of the Zambezi River. You may have the opportunity to see a variety of game; including hippo, crocodile, and elephant as well as enjoy the many different bird species. The Zambezi Sunset Cruise includes finger snacks, beer, wine, local spirits and soft drinks. This morning you will be picked up and transferred over the border to Kasane in Botswana, to your luxury safari lodge on the banks of the Chobe River. This afternoon enjoy your first safari activity. All of the bedrooms at Cresta Mowana face the magnificent Chobe River, complete with a spacious balcony from which you can observe the daily happenings amidst the abundant wildlife habitat surrounding the river. The rooms also look out onto the adjoining Namibian floodplains, where often numerous animals congregate. Enjoy two days exploring the park either by boat or on a game drive, with two included game activities per day. The Chobe region is teeming with wildlife and is, as such, a safari-lover’s Mecca. There are over 75 species of mammals in the area surrounding Cresta Mowana Safari Resort & Spa, including tens of thousands of elephants in the adjacent Chobe National Park. Game drives are led by experienced and qualified guides in an open safari vehicle. The game drive is also the ideal opportunity to capture the African wilderness, a photographers dream. The Chobe National Park has some of the largest concentrations of game on the African continent and regular sightings include giraffe, buffalo, lion, leopard, cheetah and bushbuck. Alternatively, you can choose to explore this spectacular region by boat. The Chobe River provides sustenance for many animals in the region surrounding Cresta Mowana. Spend another day enjoying this remarkable landscape with two included game activities. Today you will be transferred back over the border to Zimbabwe and Victoria Falls Airport for your onward flight to Cape Town, South Africa. Upon arrival into Cape Town you will be met and transferred to the hotel. This morning depart on a tour of the beautiful Cape Peninsula. This awe-inspiring tour to the towering headland known as Cape Point encompasses magnificent beaches, breathtaking views, and picturesque coastal villages. The Cape Peninsula is one of the world’s most scenic areas and stretches from the city centre all the way to Cape Point. In Simon's Town you will stop for the chance to see penguins and to have lunch (not included). On the way back you will also visit the beautiful Kirstenbosch National Botanical Garden. Note: The drive via Chapman’s Peak is subject to the road being open. Ou Kaapse Weg (mountain pass in Cape Town) will be used as an alternative route when necessary. Today is free at leisure to explore the wonders of this beautiful coastal city. Alternatively, you can take the opportunity to join an optional Cape Wineland Full Day Tour (not included) or a Half Day Cape Town City Tour (not included). Please note: Only one optional tour may be purchased. 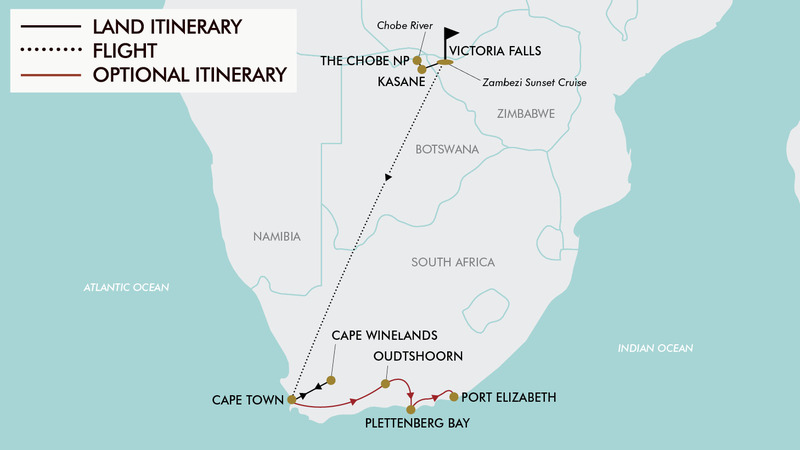 Optional Activity: Cape Winelands Full Day Tour $130 per person. This delightful drive winds into the heart of the Cape Winelands, through mountain ranges and sprawling vineyards. Head to the wine country via the N2 to the heart of South Africa’s wine industry, Stellenbosch. Walk down the canal-lined avenues, in the shade of giant oak trees and beautifully preserved historic buildings. Enjoy the first wine tasting of the day at Waterford Estate (or similar). Travel over the Helshoogte Pass to the town of Franschhoek, which dates back to when the French Huguenots arrived in the 17th century. Billed as the Gourmet Capital of South Africa, this charming town retains a French Huguenot style. Enjoy a wine tasting, followed by an opportunity to enjoy the fabled culinary skills of the Franschhoek chefs at one of the many award winning restaurants (lunch not included in cost). Continue onward to Paarl, one of the Cape’s first farming districts. The town is set at the foot of a cluster of remarkable granite domes, from which it takes its name. The last stop for the day is at a wine estate on the Paarl wine route. Return to the bustle of city life after an enthralling day in the countryside, arriving back at the hotel early evening. Situated below Table Mountain, Devil’s Peak and Lion’s Head, Cape Town offers a rich cultural and industrial heritage, grand splendour and an assurance of activity & excitement. This option is a geographical and cultural extravaganza, showing you Cape Town, from its historical beginnings to the dazzling, modern city it is today. The tour commences with a visit to Table Mountain (weather permitting; cable car fee not included). Enjoy panoramic views over the Mother City and Robben Island in the distance lying sleepily in Table Bay harbour. In the heart of the city enjoy for a short walk through the Company Gardens. From squirrels to a variety of plant life, it’s just a happy place to soak up some ‘Cape Town vibes’ and enjoy the aviaries and fishponds. On the Wale Street end of the garden you will find a monument which was created to commemorate the life and work of Desmond Tutu – lovingly referred to by South Africans as “The Arch” and a tribute to the values of the South African Constitution. Arch for Arch was installed beside historic St. Georges Cathedral aka “People’s Cathedral” for its role in the resistance against apartheid. Step inside the Slave Lodge which explores the history of these unwilling immigrants and how they have contributed to the richness and diversity of South African history. As you drive through the city you shall get a feel for the cultural melting pot that it is. End the tour with a stop at Truth Café a ‘steampunk inspired’ artisan coffee shop serving all hand-roasted coffees in a vintage cast-iron drum (any meals for own account). Return to your hotel upon completion of the tour where you may enjoy the remainder of the day at leisure. Today you will be transferred from the hotel to the airport for your return flight back to Australia. Please note: Due to flight scheduling, some Melbourne customers may experience a long connection time in Perth. Affected customers are able to leave the airport if they wish. Today depart Cape Town and travel along Route 62 to Barrydale for lunch (not included). Afterwards continue to Oudtshoorn – the ‘feather capital’ of the world. Visit a working ostrich farm for a guided tour. Afterwards check into the hotel in the late afternoon before enjoying dinner. This morning enjoy a tour of the Cango Caves, a 20-million-year-old network of limestone chambers. You will also enjoy some time at leisure at the Knysna Waterfront before proceeding to The Crags near Plettenberg Bay. Here you will embark on an informative cruise up the Keurbooms River before arriving at the hotel where you will spend the following two nights. After breakfast you will visit Birds of Eden – the largest free-flight bird aviary in the world. Next you will proceed to Bramon Wine Estate for a tasting followed by lunch (not included). Afterwards take the opportunity to take part in an optional Marine Encounter boat trip (weather and time permitting and at an additional cost) before returning to the lodge for the remainder of the afternoon at leisure before dinner. Today journey along the final leg of the Garden Route to the beautiful Tsitsikamma National Park – ‘Garden of the Garden Route’. Enjoy a walk along the suspension bridge which crosses the Storms River Mouth Gorge and offers incredible views. Arrive into Port Elizabeth at approximately 6:00pm and enjoy the remainder of the evening at leisure. Today you will be transferred to Port Elizabeth Airport for your return flight back to Australia. Please note: Due to flight scheduling, some Melbourne customers may experience a long connection time in Perth. Affected customers are able to leave the airport if they wish. *Please note some flights may arrive back +1 day due to scheduling. Travel offer is valid for travel on selected dates until the 14th September 2020. South African Airways plus any codeshare partners (subject to availability). - Arrive early is not available between 19th December 2019 – 3rd January 2020. - Stay behind is not available between 19th December 2019 – 3rd January 2020. 2 x twin or 1 x double (subject to availability). Minimum group size 2, maximum group size 16 per vehicle. The Botswana Government have announced their intention to ban the use of plastic carrier bags effective from the 1st of November 2018. Guests travelling to Botswana should be aware of this and are advised to not carry plastic bags into the country. The proposed fine for carrying plastic bags will be US$500. - Bags with longs straps will not be allowed. In the area of Victoria Falls, the climate is sub-tropical, with a mild and dry winter from mid-May to mid-August (during which, however, nights are cold), and a hot, muggy and rainy summer from mid-November to mid-March. The rains occur in the form of short downpours or thunderstorms. Between September and November, before the rainy season, is the hot period, in fact the hottest of the year, in which the temperature easily reaches 35°C, and sometimes even 40°C, even though the humidity is not as high as in summer. Precipitation is not abundant, since it amounts to 660 millimetres per year, but it is quite abundant from December to February, while it almost never rains from May to September. The climate in Kasane is referred to as a local steppe climate. During the year, there is little rainfall in Kasane. The average annual temperature in Kasane is 22.9°C. In a year, the average rainfall is 643 mm with the majority of rain falling between October and March, with December and January being the wettest. 15 meals are included in the tour, for all other meals; lunches and dinners the tour leader (when available) will offer assistance with reservations, suggestions and directions to local restaurants. It is your responsibility to notify TripADeal of any dietary requests/requirements. Please note; we will do our best to meet your requests/requirements, however cannot guarantee that we will always be able to. Gratuities (tips) are not included in the tour price for services of the tour leader (when available) and driver throughout the tour and are optional and at the customer's discretion. A double entry visa can be purchased on arrival in Zimbabwe for approx. $45 USD when travelling on an Australian passport. Visas are not required for South Africa & Botswana when travelling on an Australian passport.